What New West Writers will be supporting and encouraging local writers by hosting three established authors and editors to offer face to face feedback at a Blue Pencil Café. Alan Hill – is the Poet Laureate of the City of New Westminster. He has published two full collections of poetry and been published in over forty literary magazines and periodicals across Europe and North America. In Canada his publication credits include CV2, Event, Canadian Literature, Acta- Victoriana, Dalhousie Review, Antigonish Review, Sub- terrain, Windsor Review, Poetry is Dead and many others. Jennifer Sommersby – a writer, copy\line editor and committed bibliophile. She writes romcoms/women’s fiction under the name Eliza Gordon; her latest release is Dear Dwayne, with Love from Lake Union Publishing (January 23, 2018). Her debut YA novel (under her own name) Sleight is the first in a duology and publishes on April 3, 2018, from Harper Collins Canada and Sky Pony Press (US). Jenn/Eliza is represented by Dan Lazar at Writers House. Betsy Warland – is the author of twelve books and has more than thirty years experience as a writing teacher, editor and manuscript consultant. Her book Breathing the Page: Reading the Act of Writing, published by Cormorant Books in 2010, is a best-seller. Her latest book Oscar of Between: A Memoir of Identity and Ideas from Caitlin Press (Dagger Editions) was published in April 2016 to critical acclaim. Registration Pre-registration via email is required. This will take place between March 1 – April 10. Registrants will be asked to provide three time options with their preferred guest. We will do our best to accommodate the request and will work on a first-come, first-served basis. Do not use the email (link below) for anything other than registration. Registrations will be acknowledged but not always on the same day — patience is appreciated. As space will be in high demand, no-shows will no doubt attract bad karma. On the day Parking will be in the pay parking area at the Quay. Report to the desk at the entrance to the Network Hub on the first floor of the River Market. Allow sufficient time to park, walk to River Market, and arrive at least 5 mins before the appointment time. Latecomers may not be able to have their full allotted time. About New West Writers New West Writers stands out as one of the core groups of Metro Vancouver’s finest local talent of emerging and established poets, writers and authors. 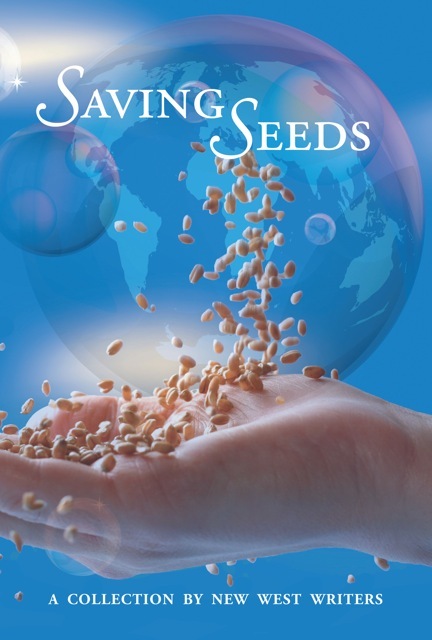 Saving Seeds – A Collection by New West Writers showcases an eclectic selection of poems and stories that invite the reader’s imagination to cross over landscapes, waterscapes and wordscapes in the discovery of new worlds. We currently publish an annual Literary Magazine, Collage — next edition available from April 14, 2018.